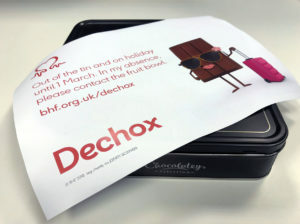 DECHOX – Giving up Chocolate for February! You may think cycling 1300 miles might be a tough challenge, but Sam faces one of her biggest yet – DECHOX! Dechox is a nationwide challenge, set by one of Sam’s four chosen charities, The British Heart Foundation. The challenge is to give up chocolate throughout February. From a chocolate dusting on a cappuccino to sprinkles on your sherry trifle; anything with cocoa in it is off limits – especially those chocolate biscuits for elevenses! If you would like donate towards Sam’s 4 chosen charities as part of her 40 challenges, donations can be made here, or if it has inspired you to take part in Dechox, you can sign up here.